Treat your best friend to a droolicious, artisan-baked goodie with the Three Dog Bakery Crunchy Hearts Biscuits Peanut Butter Flavor Grain-Free Dog Treats. These grain-free heart-shaped biscuits are made with all natural ingredients like 100% peanut butter, potatoes, and flaxseeds. They’re handmade by dog-loving artisans with never any fillers, wheat, grains, sweeteners, artificial colors, flavors, or preservatives. Plus, they’re slowly baked in USA kitchens to preserve their deliciousness, and come in a convenient and easy-to-store resealable pack. Grain-free, heart-shaped biscuits made with all natural ingredients. Baked with real ingredients like 100% peanut butter, potatoes, and flaxseeds. Made from scratch and handcrafted by artisans in dog-loving kitchens. 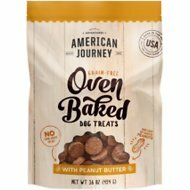 Slowly baked to preserve the delicious peanut flavor that dogs love, as a snack or reward. Made in the USA with never any wheat, grains, artificial colors, flavors, or preservatives. 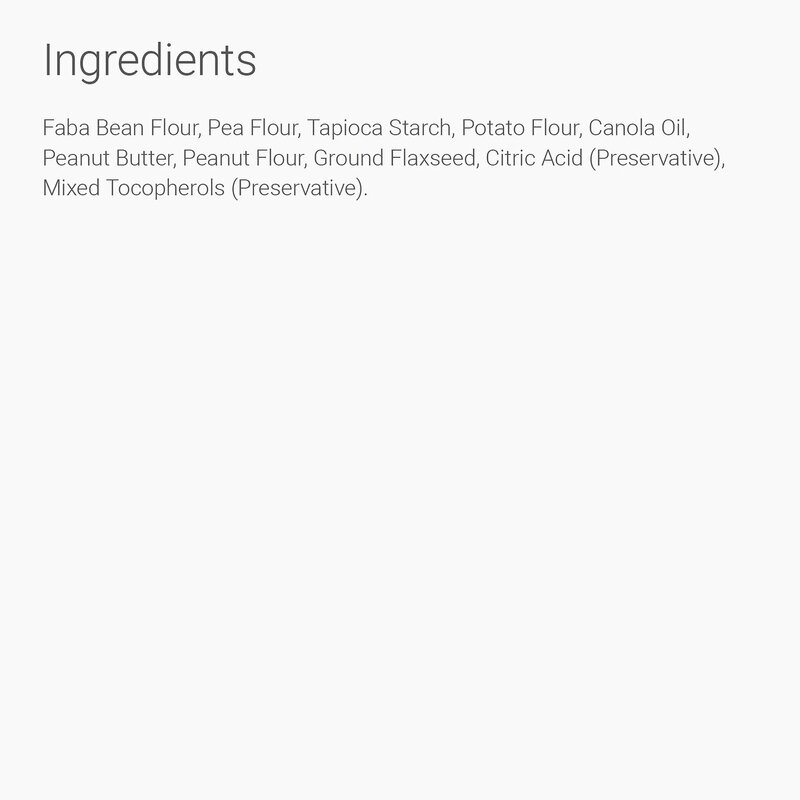 Faba Bean Flour, Pea Flour, Tapioca Starch, Potato Flour, Canola Oil, Peanut Butter, Peanut Flour, Ground Flaxseed, Citric Acid (Preservative), Mixed Tocopherols (Preservative). These treats are intended as a snack or reward and are not formulated to serve as a complete and balanced meal. Three Dog Bakery came to be all thanks to a rescue pooch named Gracie. She was sensitive to most foods, including your typical canine kibble. That's why the dog-loving chefs at Three Dog Bakery decided to bake her fresh treats in small batches with real ingredients. Now, just like Gracie, your pup can enjoy a tasty, baked treat too. They look so good, even you'll be tempted to steal a bite! When you think of a bakery, cookies are just one of the many comforting treats that may come to mind. That's why Three Dog Bakery has a whole line of them. Their Classic Cookies and Classic Cremes are inspired by the same cookies that pet parents love to eat. With cookies stuffed to the gills with irresistibly delicious cream fillings and a variety of flavors to choose from, you can't go wrong. 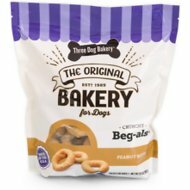 Crafted from scratch by pastry chefs, the Biscuits and Beg-als from Three Dog Bakery are made with simple ingredients like real peanut butter and rolled oats. Every small batch is slowly baked to lock in all the drool-worthy flavor your dog loves plus some beneficial nutrients he deserves. Once your canine companion takes a bite out of these crunchy rewards, he'll certainly be begging for more. 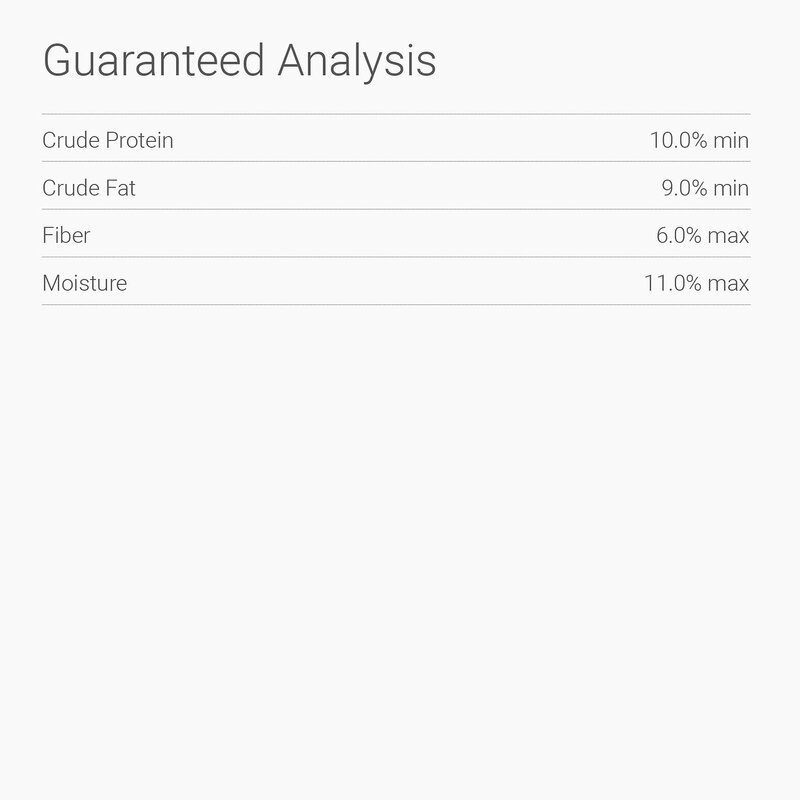 Whether your pup is sensitive to grains or just needs to watch his figure, Three Dog Bakery offers plenty of grain-free options to choose from, so he doesn't have to worry about a thing. Each grain-free creation is crafted with real vegetables, fruits and protein for a taste that even the pickiest dog will devour with delight. From a passion and love for dogs, Three Dog Bakery was founded in 1989 with one mission—to freshly bake the world's best artisan dog treats and provide pet parents with all-natural rewards they can feel good about giving their furry friends. Handcrafted in the USA with wholesome ingredients, Three Dog Bakery offers a variety of treats you can trust that are packed with the flavors your dog craves. The treats from Three Dog Bakery are fun for us and yummy for our fur kids. Danny likes these biscuits as a snack when we leave him alone for a while. Awesome treats. My dog really loves them !! They are an every day staple for her. 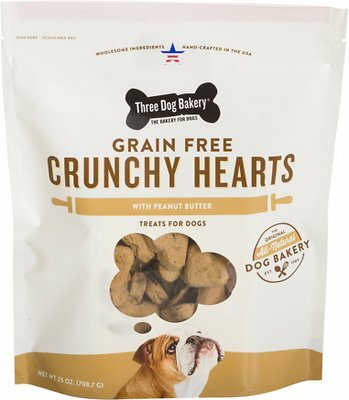 The cutie little heart-shaped treats are grain-free and make my dog go crazy! They're easy to break the little hearts in half too if you want to give smaller treats. I'd say they're about the size of a poker chip or a little smaller. We have two small dogs, one of whom was diagnosed with diabetes. We had to change her food and treats. She loves these crunchy treats. Our dog has allergies. In trying to figure out what works for her we discovered these biscuits from Three Dog Bakery. The Chewy price to our surprise was much less than buying directly from Three Dog bakery, so we went with Chewy when it was time to get more. However, if you looking to get them quickly, please be advised that it took almost a week to receive them, not 1-2 days. All 3 of my dogs love these. I like them because they are a nice size for my medium sized dog and can break easily in half for my smaller dogs.